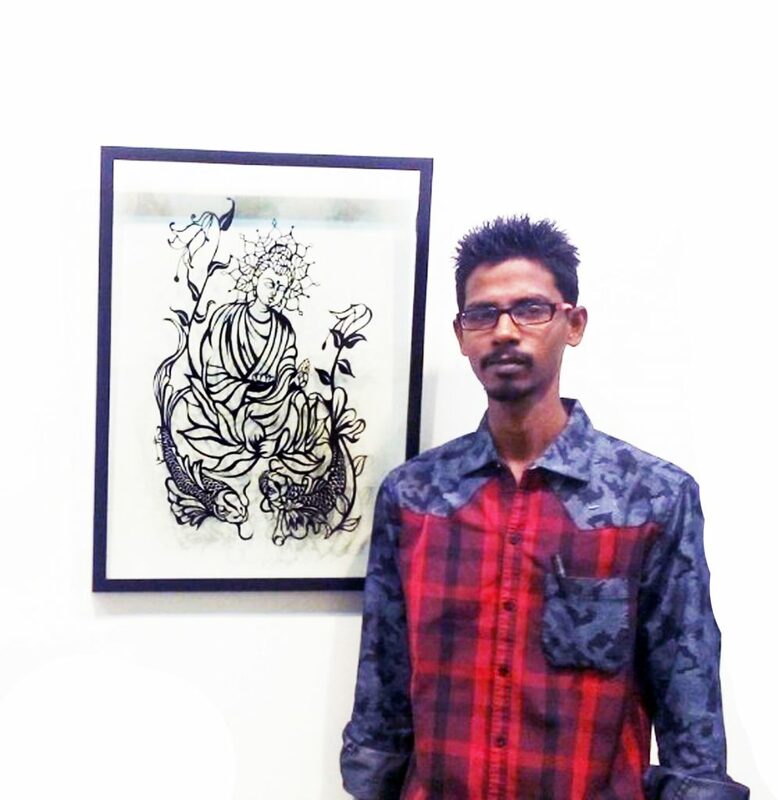 Vinodh Kumar is a Paper Cutting Artist based in Chennai and follows the Jianzhi, a traditional style of paper-cutting in China which was listed in UNESCO Intangible Cultural Heritage Lists, 2009. Tell us about the art of Paper Cutting Art. It is a kind of an art work made by Paper and giving an aesthetic value. 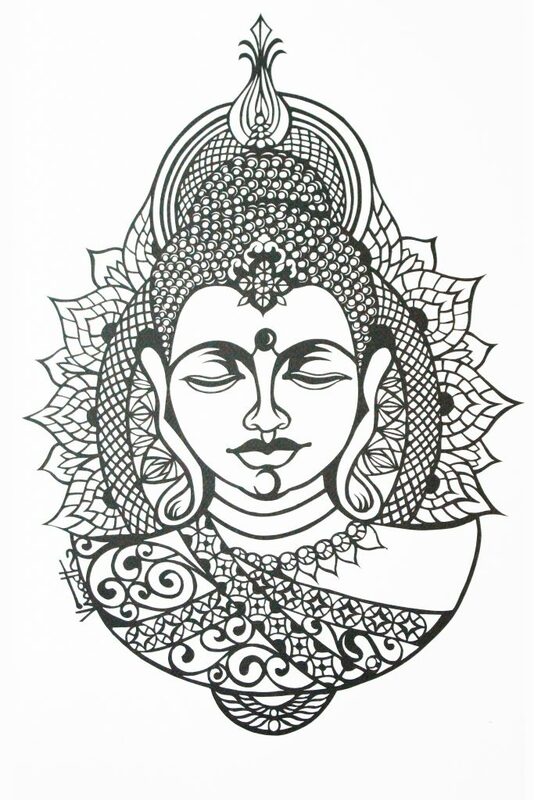 SANJHI is the Indian art of Paper Cutting. The cut paper is usually placed on the floor and colors are filled into to make rangoli. Paper Cutting is the art of cutting designs. The art has evolved uniquely all over the world to adapt to different cultural styles. 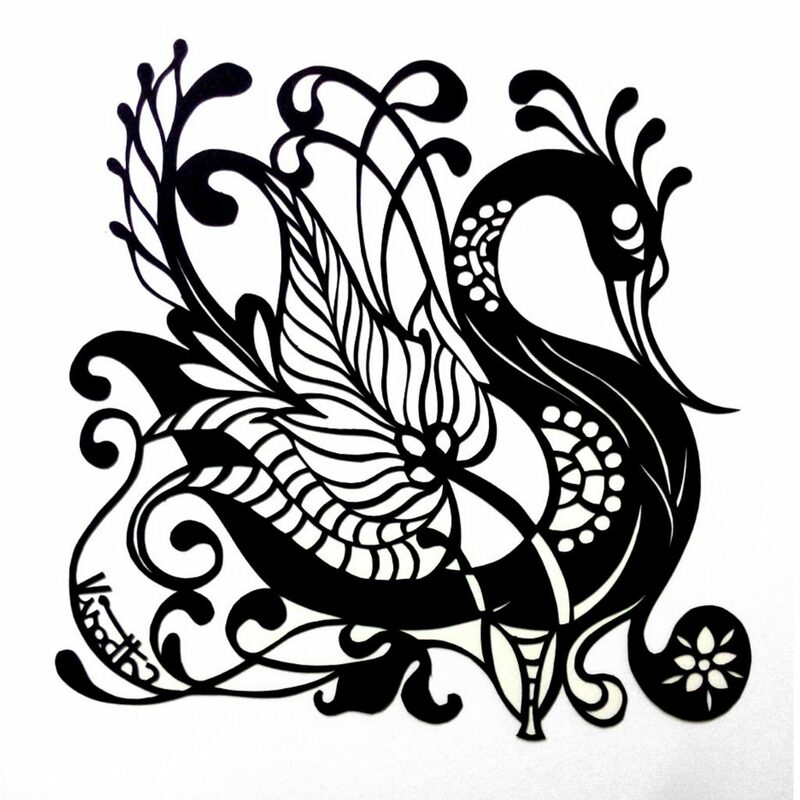 JIANZHI is a traditional style of paper cutting in China which I do. Jianzhi has been practiced in China since the 6th century A.D. Jianzhi has a number of distinct uses in Chinese culture, almost all of which are for health, prosperity or decorative purposes. Though Paper cutting is popular around the globe, only the Chinese paper cut was listed in UNESCO Intangible Cultural Heritage lists, which was in 2009. 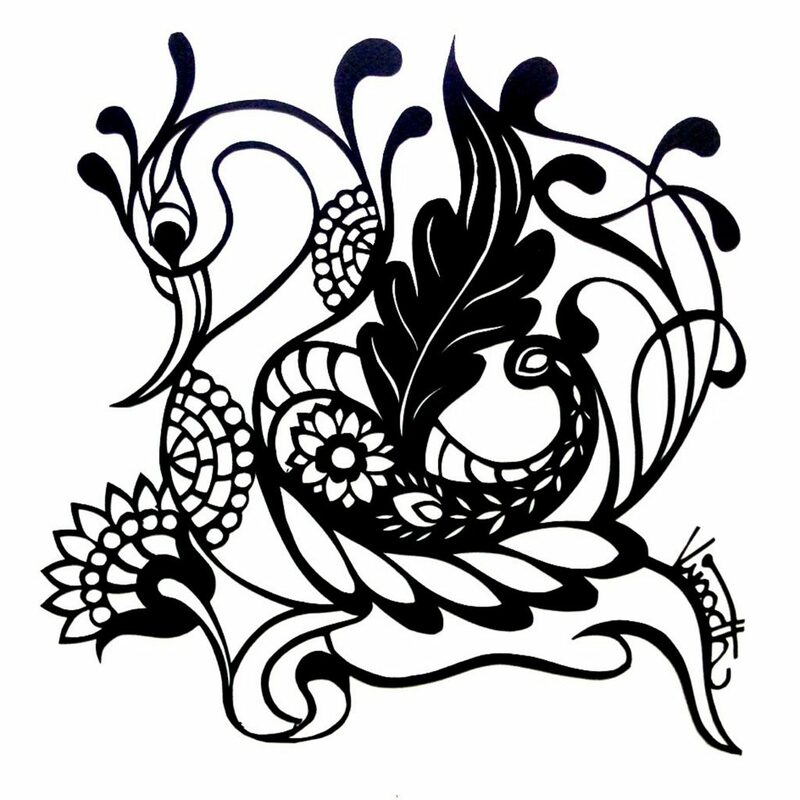 And I use this Chinese style of Paper cut in my work. • Draw what you require or what you want. • Have the pre-requisites in that picture and clear away the redundant ones by the art of cutting. • In Paper Cutting, Structural study is most important. • We are all aware, Paper is very delicate material & when it is cut, it becomes flimsy. Hence we have to be more attentive to avoid the design getting collapsed. Or else, we would not get the desired shape. • More we practice with the intricate designs, the more we would experience in it. 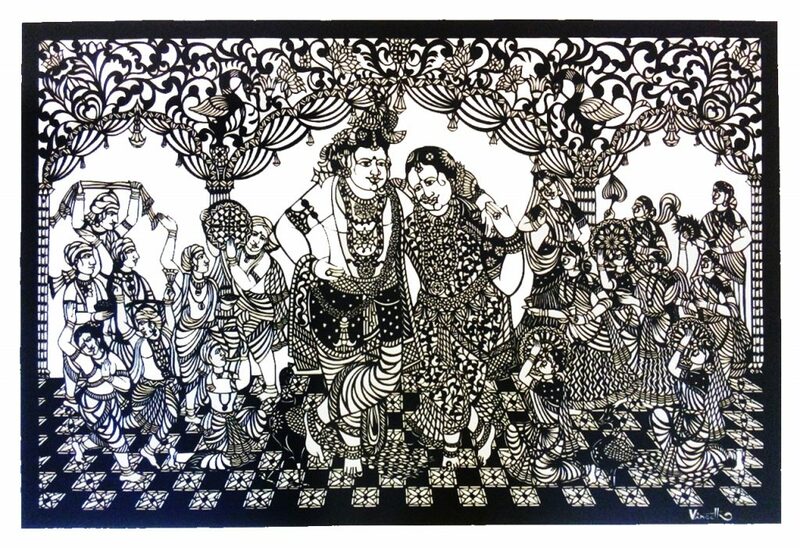 In India, Paper Cutting Art is not seen as an art. Instead people see this as a craft. There is a difference between an art and a craft. It is examined in a comprehensive manner. How did you get the idea of Paper Cutting Art? For the first time I saw this in YouTube. Later I initiated as a Hobby & occupied myself more into it. Initially I was finding it very challenging to learn. Gradually, I rectified my blunders which has borne fruit today. Have you undertaken any formal training for your artwork and from where? No. I went to a trip to Goa with my friends. Incidentally, I met a Paper Cutting Artist there. I stayed with him for two days to learn something new and as to how he works. Also, he went through my work and gave me very useful inputs. Which has been your most memorable piece of art that you have created? Can you give us a brief description about it? 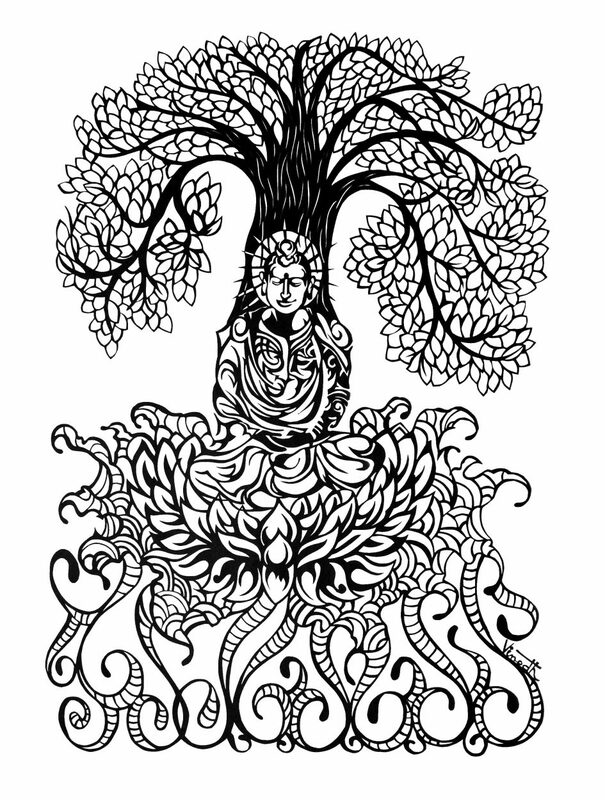 • It’s a Buddha picture portrayed in a lotus with two fishes encircled by blossomed plants. • According to Buddhism, Buddha is known to be a enlightened person and he is not been treated as a God. 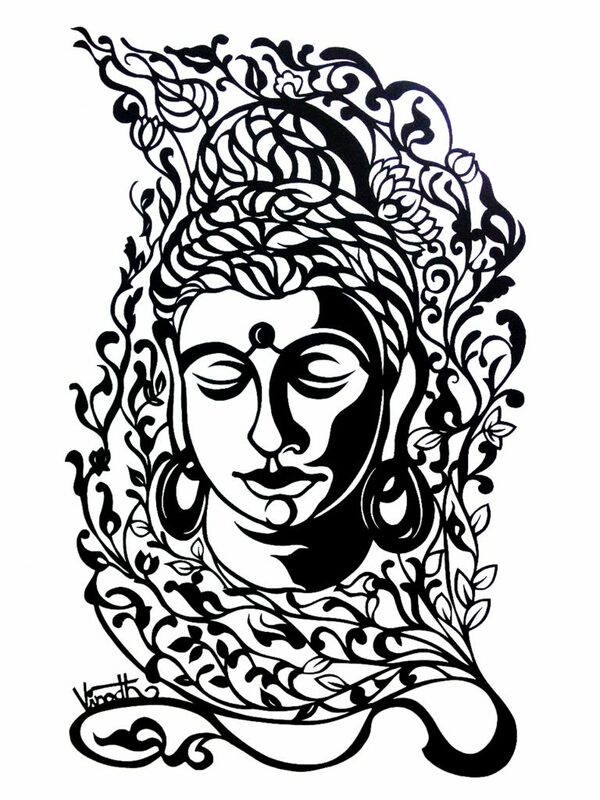 Hence, I sketched Buddha in a distinctive pattern. Physical activity is not shown. Smile is one factor among body reactions. To show that difference, I have designed him in a very calm state of action. • In his Zenith stage, to show the pinnacle of his awareness I have portrayed him with a spot i.e a third eye as if comparing with Lord Shiva. Then to express his permanence in all situations, I have picturized him like postured in a lotus flower. To seed a good thing – date, time and good people are not required – It’s my thought. Hence to describe that, I have manifested him like he enshrines us from his left hand. A society has both affirmative thinking and contradictory thinking people. 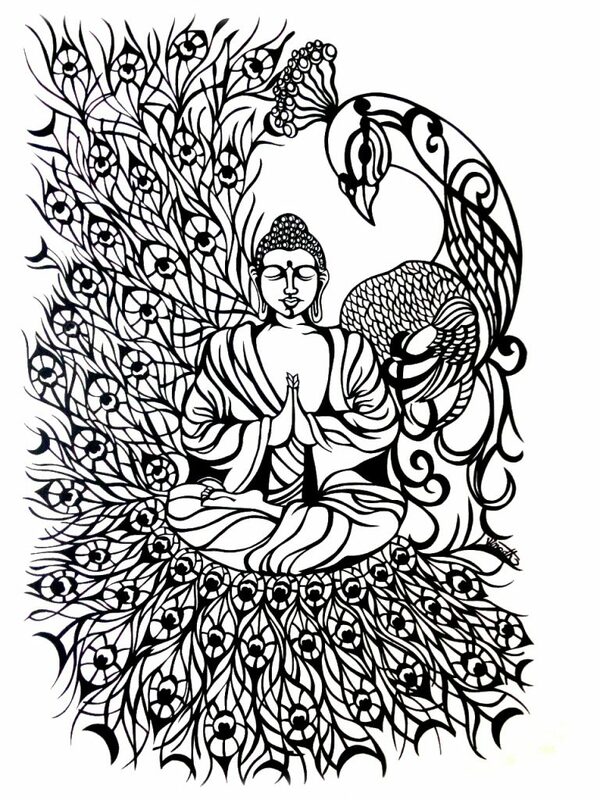 To elucidate this, I designed them as two Fishes – one faced towards Buddha and another one away from Buddha. A positive thinking person would always be flexible and would not hurt any individual. 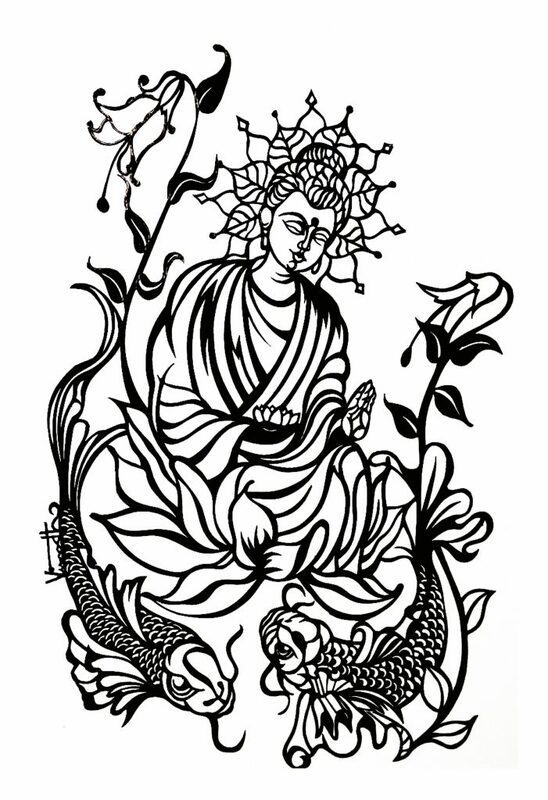 To demonstrate that character (or) attitude, I sketched the fish facing towards Buddha with a smooth feathery tail. On the other hand, another fish with a sharpened tail depicts the contradictory person in this society. 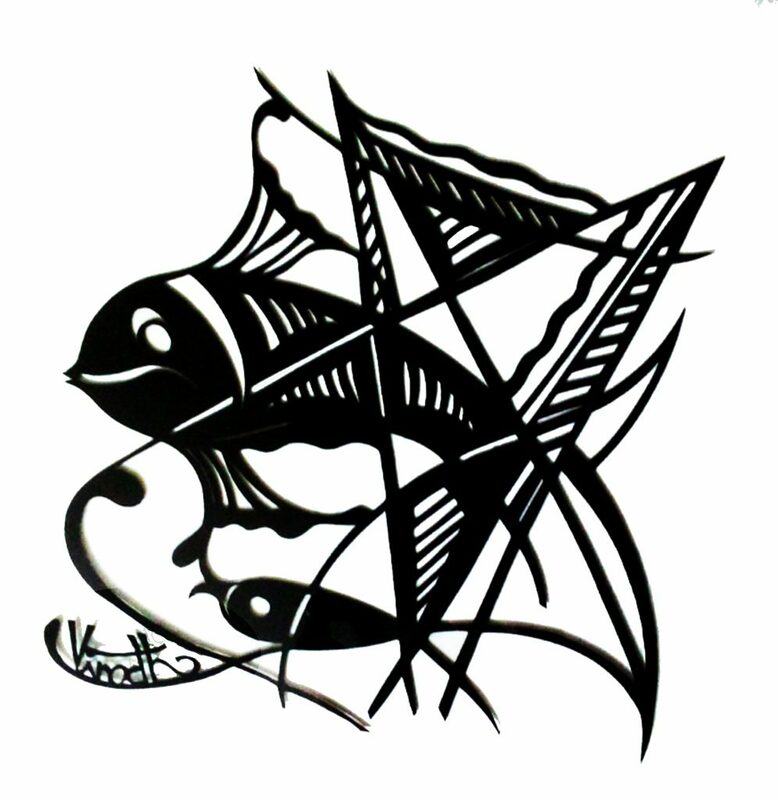 To counter balance the fishes weight, I have given connections in some places in this design. To exhibit Human’s happiness with blooming hearts, I drafted two blossomed plants. It has two types – Primary one would be exposed only from outward part. Contrary to that one is from the inward to the outward. The Plant exemplifying negative thinking people would start from the fish’s tail portion. Whereas the plant characterizing positive attitude blossoms from the heart segment of the fish. Both the plants starts their growth with the same height. But the negative perspective plant would be distinguished like as it had grown larger. The flourishing happiness must start only from the inner region. Then only it survives in this society. How much time does it take to create a piece of art? Where can one purchase your art work? For an art work, time required depends on the intricate design what I choose. Normally for A4 size work, it requires 3-4 days. What is your usual workflow pattern for a paper cutting art project? A. I start with my interested subject and collect all the details of the same. Without a detailed information, I do not start my project. Initially I draw a rough design and check whether the needed composition comes into it. After preparing this if it gets through I make sure that design reflection appears in my Paper cutting Art work. B. On the backside of the paper which I work, I first draw the reverse image of the required pattern. C. Then I show the difference of inclusion and exclusion by way of shading them. D. Removing the exclusive parts by Cutting. E. How to cut for eg: whether it is from Top to Bottom , Bottom to Top, Inner to Outer, Outer to Inner – all these depends on the design what we choose and also on the experience what we have in it. What are the tools/software that you use regularly as a part of your work? I am not using any software tools to create this art work. Mostly I would prefer to take designs from the photographs which I have taken. I work based on the orders which I receive. Currently working on an order I received – Lord Krishna & Radhai Marriage Celebration. What message do you have in mind for the aspiring artists? a. What has to be done, how to be done – these needed to be planned. b. To start with, trying with simple designs would give a basic idea & experience. c. Then, give importance to all the comments which you get for your work from the public . Especially, the negative ones. Because that would only makes us to think in a different angle leading to our growth. d. Try to minimize the mistakes which you did in the previous work while working on the next. e. Practice daily and learn it.